This entry was posted on June 27, 2009, 6:08 PM and is filed under My Projects. You can follow any responses to this entry through RSS 2.0. You can leave a response, or trackback from your own site. The integration looks nice. 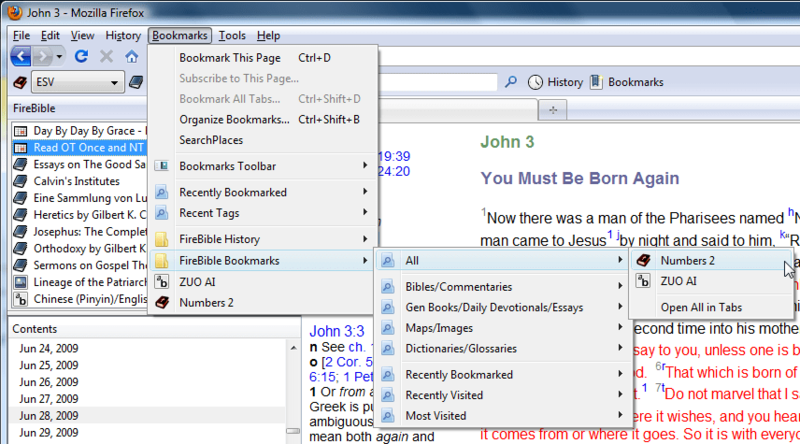 However, I think its usefulness is going to depend very much on what you see bookmarks used for. I already have too many bookmarks in Firefox for a menu to work well, and I have far more in my BPBible topics (probably ~200 topics, and I don’t know how many passages). While Firefox’s Organise Bookmarks functionality works pretty well, I’m not sure how well it will scale to organising and managing this many topics and references (I’m not talking about software scalability here, but UI scalability and whether it remains managable). It’s definitely not going to work in the bookmarks menu. Jonathan, thanks for taking the time to look at this. If I have understood you correctly, you’re fine with *using* bookmarks from a menu (or several menus, sometimes nested) or a bookmark tree in the sidebar (View > Sidebar > Bookmarks) but you’re not too happy with FF’s bookmark organization capabilities? The ability to tag URLs and the Places query support may make some of the organization we needed to manually do earlier unnecessary, with all of it encapsulated in a smart query. 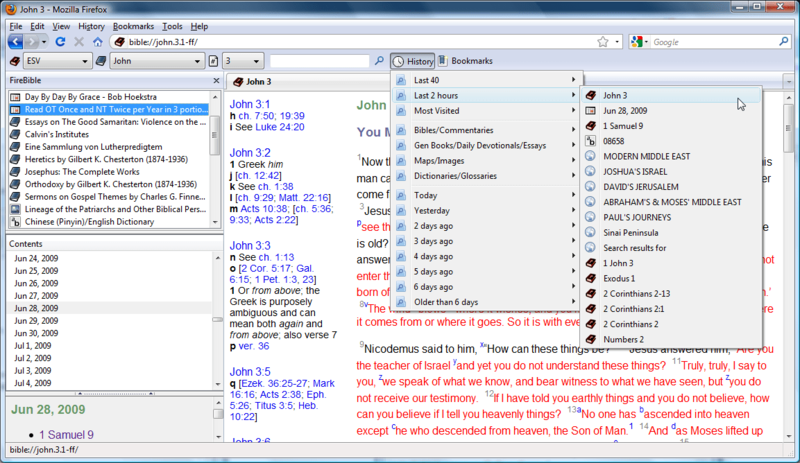 There are also many extensions for FF which could help though I have never used any of them. Do you have any suggestions or examples of better UI? Perhaps I could integrate some of those into FB. I was actually saying the reverse (I think). I have too many topics and bookmarks, and navigating them with the menu is slow and cumbersome. The Organise Bookmarks is much better. One thing that I think is of great importance is being able to view the topics/folders that any particular verse is contained in. Another thing that I think is important (and have no idea if you do or not) is to allow bookmarking of a verse range, not just a single verse. There are so many things you want to mark that don’t fit into the arbitrary verse boundaries.